Alkalizing Foods: Eat Freely: 70-100% of your diet! Green Veggies! and the following RAW: kale, spinach, lettuce, bell peppers, tomatoes, radishes, onions, garlic, lemons, limes, cucumbers, coconut, asparagus, fresh herbs such as basil and parsley, eggplant, chives, celery, fennel, sprouts, leeks, avocado, cauliflower, broccoli, cabbage, and grasses. Also, plenty of healthy salts, raw oils and pure alkaline water. Whole grains such as quinoa, barley, rice, buckwheat, and spelt, tofu (non-GMO! 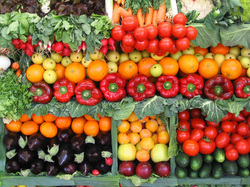 ), fruit, sweet veggies such as carrots, squash, pumpkin, grapefruit, potatoes, peas, most seeds and nuts, and beans/legumes. Oily fish such as wild salmon and tuna. Acidic Foods: Should never be eaten...yikes! mushrooms, algae, meat (red, white, or pink, from any animal or bird), dairy products (includes raw, pasteurized, or from any animal), alcohol, yeast of any kind, vinegar, coffee, chocolate, peanuts and peanut oil, corn, canola, non-organic soy, GMO foods, microwaved food, eggs, fermented products, white flour, sugar of any kind, agave, honey, and processed foods.